Virginia Woolf is considered by many to be one of the greatest British writers, for her timeless exploration of the human condition but also for addressing the key anxieties of the post-first world war society. A born-and-bred Londoner, she was a key member of the highly influential Bloomsbury Group who lived in that quarter while producing some of the most influential and poignant literary texts of the 20th century. Woolf was born Adeline Virginia Stephen in January 1882, the youngest daughter of the successful author and critic Sir Leslie Stephen. Virginia Woolf's childhood home and plaque. Photos from the excellent London Remembers website. Her childhood home at 22 Hyde Park Gate in Kensington still survives just a stone’s throw from the Royal Albert Hall. This upper-middle-class street is today full of embassies, and boasts former residents such as Sir Winston Churchill, Sir Jacob Epstein and Nigella Lawson. Number 22 is adorned with three separate English Heritage blue plaques. One for Woolf’s father, the second for her sister the painter and fellow Bloomsbury Group member Vanessa Bell, and of course the third one is in honour of Woolf herself. While still living at the family home, Woolf enrolled at King’s College London. She is now depicted outside the entrance of the Strand campus, along with other famous alumni. As a woman seeking further education in the late Victorian age, Woolf was only able to attend King’s Ladies’ department, which was not located at the main campus but at 13 Kensington Square, close to her family home. She studied subjects including Latin, Greek and History between 1897 and 1901, while both her brothers Thoby and Adrian attended Trinity College Cambridge. This experience of entrenched gender inequality surely left an impression on Woolf and, perhaps, even influenced her seminal 1929 essay A Room of One’s Own. After the death of her father in 1904, Virginia, Thoby and Adrian followed their older sister Vanessa to live first in rooms at 46 Gordon Square, and then into one of the smart Georgian terraces facing Fitzroy Square. By the 1911 British census, only Adrian and Virginia are listed as living at 29 Fitzroy Square — Thoby had died suddenly of typhoid in 1906, and Vanessa had married Clive Bell in 1908. Virginia Woolf's Fitzroy Square address, from the London Remembers website. 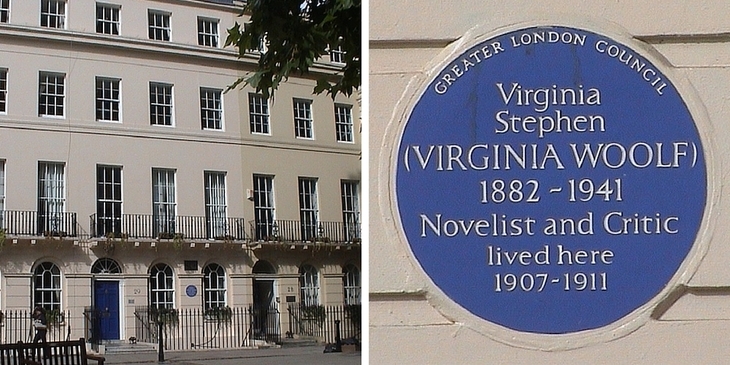 The grand white house now forms the offices of a chartered accountants firm but the building’s literary significance is acknowledged by the presence of another blue plaque that denotes the dates of Woolf’s residency. A year later, in August 1912, Miss Virginia Stephen left her Fitzroy Square home and became Mrs Leonard Woolf, following a small civil ceremony held at St Pancras Central Register Office on Judd Street (now renamed Camden Town Hall). By this time, Woolf had already started writing and revising her first novel The Voyage Out but was suffering from the illness that would play such a dominant role in her life. By February 1915, Woolf was experiencing a prolonged period of depression that was to last until 1917. A quieter life in Richmond, on the southwest outskirts of London, was decided to be a more suitable location for Woolf to work and recover, so the couple moved into one half of Hogarth House on Paradise Road. 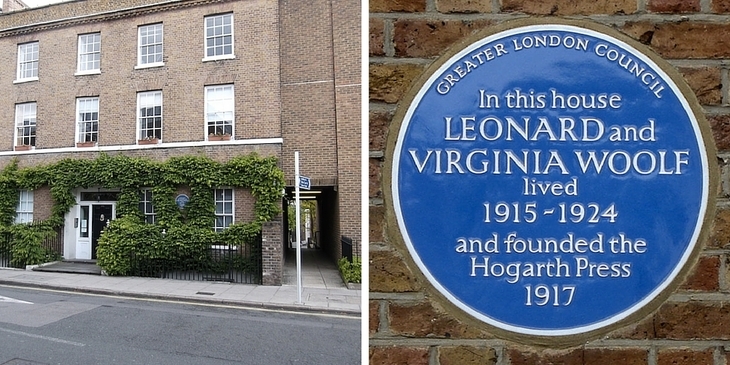 While there, Virginia and Leonard founded the successful Hogarth Press, which would publish the couple’s future works as well as the first UK book edition of TS Eliot’s The Waste Land in September 1923. In March 1924, Woolf returned to live in London full-time after a decade in Surrey, moving to 52 Tavistock Square. 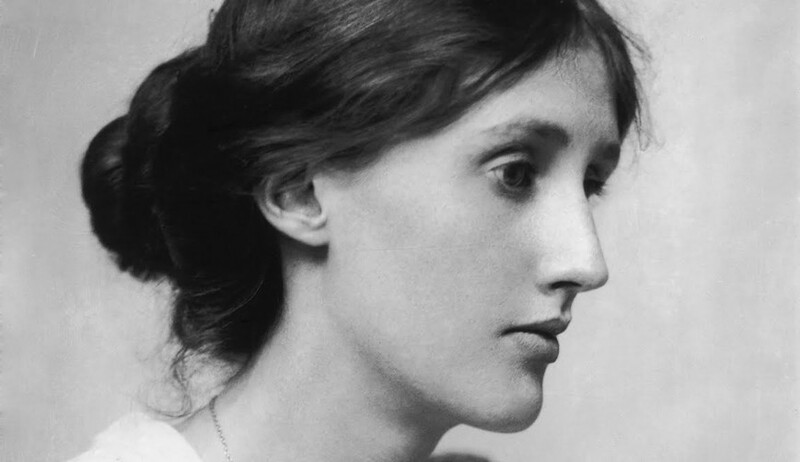 “Her pleasure in being back in town fed into Mrs Dalloway, not least in her description of Mrs Dalloway's walk through London," Frances Spalding, curator of a National Portrait Gallery exhibition on Woolf, tells us. While Woolf found the city an exciting, living space, she clearly felt the same frustrations as the average modern commuter. In The Waves, the introverted Rhoda makes an exclamation that resonates just as strongly now as it did when it was first published in 1931: "[O]h, human beings, how I have hated you! How you have nudged, how you have interrupted, how hideous you have looked in Oxford Street, how squalid sitting opposite each other staring in the Tube!" With the exception of the Underground, most of the immediate sensory experiences of Woolf’s London are distant memories from the streets of today. 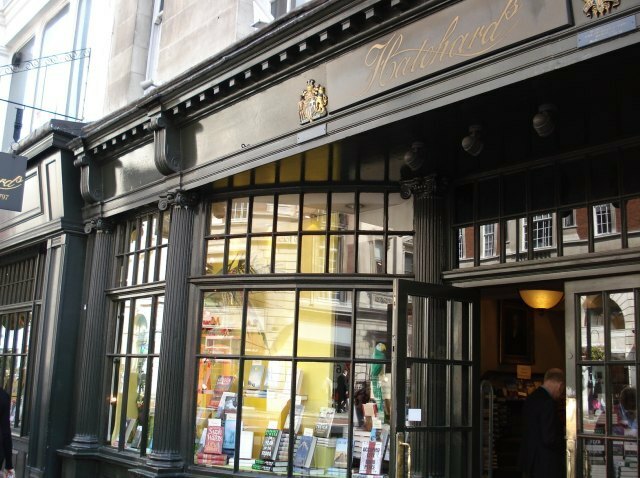 It is possible, however, to follow in Clarissa Dalloway’s footsteps by visiting Hatchards Booksellers, which is still located in the same location at 187 Piccadilly. You can also read more extensively about the shop’s literary connection with Woolf, and other locations from Mrs Dalloway, in a previous Londonist article. Hatchards. Image by Rachel Holdsworth. After the 1925 publication of Mrs Dalloway, Bloomsbury continued to inspire Woolf's writing. Tavistock Square itself, proved to be a particularly creative location, as Woolf notes in her diary that it was during a walk around the square that she conceived the ethereal and abstract novel To The Lighthouse (1927). Leonard and Virginia lived at 52 Tavistock Square up until 1939 before moving to Mecklenburgh Square further east. 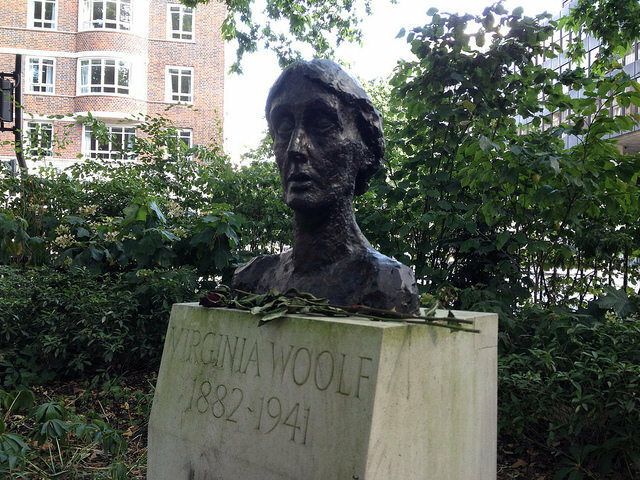 A bronze bust of Woolf now stands in Tavistock Square, in the corner closest to the site of her apartment. The apartment was badly damaged in the Blitz, and the Tavistock Hotel now stands on the site of the Woolf’s former home. Mecklenburgh Square also experienced bomb-damage during the war, which influenced the couple’s permanent move to their home in the Sussex countryside, Monk’s House. By this time, however, Woolf’s mental health had already declined rapidly and she would never return to the city that inspired many of her Modernist works. She took her own life by drowning in the River Ouse in March 1941. Bust of Virginia Woolf in Tavistock Square, by upthewoodenhill in the Londonist Flickr pool. What would Woolf find inspiring about London today? 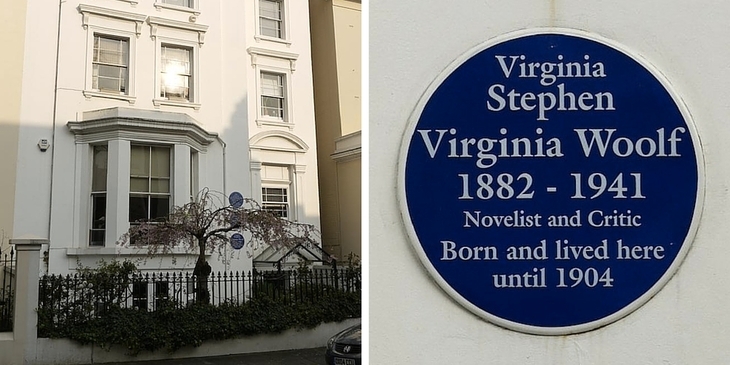 See also: A complete list of Virginia Woolf's London homes.